Mattresses greatly vary in their materials and make. 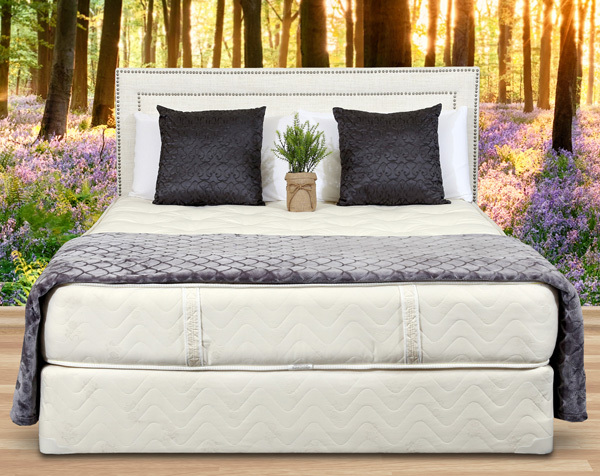 As you browse through mattress options, you’ll find yourself knee-deep in terms that relate to mattresses like softness, support, innerspring, memory foam, tufted, non-tufted, and many other attributes that define the product. On this list, hand tufting is an incredibly desirable feature. Here’s why. Tufting is the process of compressing upholstery materials to ensure they perform consistently for a long period of time. Tufting, when done well, is done by hand. In our case we use a large press that the mattress slides into and squeezes it down about 50% in height. We then use special tufting needles to push a heavy-duty nylon twine through the mattress and knot it to maintain its tension once the press is released. Why Are Tufted Mattresses Better? They keep their shape. Tufting is a time-consuming process, especially when done by hand. However, this detailed step prevents the inner materials of the mattress from settling over time. The filling is more tightly compressed, keeping the mattress from sagging and preventing materials from bunching or lumping in disproportionate ways. You sleep better. In short, a better mattress equals better sleep quality. Since tufting keeps mattresses in better shape for a longer period of time, they provide you amazing sleep support for years. Why settle for an uncomfortable mattress that doesn’t align your spine? They last longer. Hand tufted mattresses are the pinnacle of quality. You can rest assured that when you purchase a hand-tufted mattress, it has been designed to last many years. After all, you spend 6-8 hours every day with your mattress – you want something that is going to last. Hand Tufting vs. Machine Tufting: Is There a Difference? Hand tufting, which is exclusive to traditional innerspring mattresses, is the hallmark of a luxury mattress. Hand tufting will make your mattress last longer compared to machine-tufted mattresses or cheaper beds-in-a-box, which cannot be tufted. When choosing a tufted mattress, take care to check if it’s hand or machine tufted. Machines don’t pay any fine attention to detail. However, when a mattress is hand-tufted, a real professional inserts each tufting strap with care. Ultimately, you want high-quality tufts that penetrate all layers of the mattress to hold its structure in place. Cheaper machine-made alternatives will feel shallow and not as firm. They also won’t hold the filling in place as long as hand tufting can. Once you feel the difference of a hand-made quality mattress, it’ll be difficult to settle for anything less. Gardner Mattresses are hand-crafted, organic, and hand tufted on both sides. They’re also made with only the best materials and expertise. If you’re looking for a mattress that will get you through the next decade, try one of our hand-tufted mattresses risk-free. Call now at 1-800-564-2736. Next article	Should You Buy a Bed with an Adjustable Base?